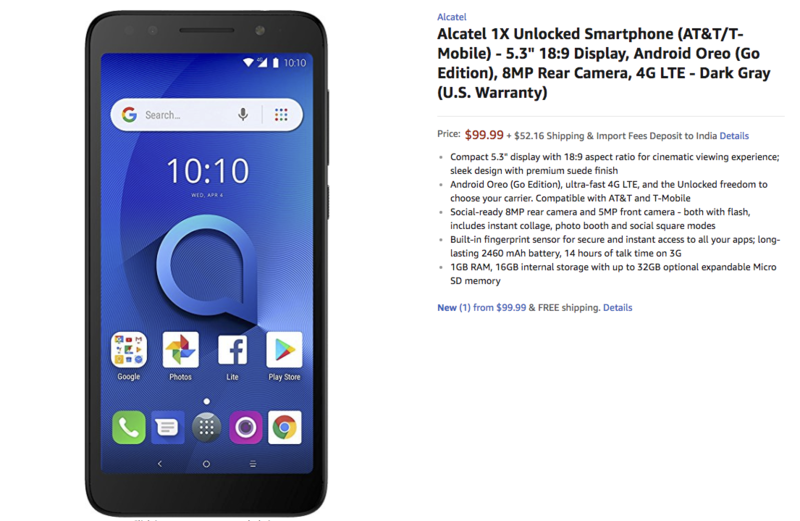 The Alcatel 1x smartphone which was announced at MWC, held earlier this year in February was announced to be made available in the US and now the device is going for pre-order in the country. The smartphone is priced at $99.99 for the unlocked version and it will be released on 4th of June. Although the device is priced very low, we cannot expect much from this entry-level smartphone. Well, going with the specs sheet it won’t look impressive by any means but yes, it will be running on Android Oreo which is the Go Edition. This Go Addition of the OS is developed by Google to run well on entry-level devices also which come with low-end specifications. Apart from this, the company is also offering a 5.3-inch touchscreen display with 480×960 resolutions with 18:9 aspect ratio. There is a 2,460 mAh battery on the device which cannot be expected to last an entire day even with moderate usage. There is a MediaTek MT6739 SoC with 1.3 GHz quad-core Cortex-A53 CPU to power the handset and it will be accompanied with a mere 1GB of RAM. On the camera section, there is an 8MP sensor on the rear which with LED flash and also a 5MP sensor on the front for video calling and selfies which is accompanied by a flash. The onboard storage is limited to 16GB, which could be extended further up to 32GB with a microSD card. There are other connectivity options like 4G LTE, Bluetooth v4.2, GPS, A-GPS, Wi-Fi 802.11n and a micro USB port. Furthermore, the handset also has a fingerprint sensor on the back which has become an important part of a smartphone to enhance the security levels. The Alcatel 1x is compatible with T-Mobile and AT&T but nothing is mentioned about the availability of this handset in other markets, which is expected to happen soon. Are you planning to get this handset? Comment in the section below and stay tuned to Android Advices for more updates.